President Serzh Sarkisian’s chief military adviser effectively defended on Thursday individuals who filmed and publicized abusive treatment of two soldiers by their commander, which has caused public outrage in Armenia. The official, Colonel-General Mikael Harutiunian, told RFE/RL’s Armenian service that the scandal could actually help the Armenian military combat chronic hazing and other abuses within its ranks. The amateur video posted on Youtube earlier this month shows a uniform-clad man hitting and humiliating the conscripts during what looks like a picnic. The Armenian Defense Ministry subsequently identified him as Major Sasun Galstian. Galstian was last week arrested and charged with abuse of power, a crime punishable by between two and five years in prison. The ministry initially questioned the veracity of the footage and said those who posted it on the Internet are keen to “discredit” the Armed Forces. A ministry statement issued on Wednesday said that military investigators are currently interrogating another serviceman who shot it on a mobile phone camera in the presence of his father and brother. 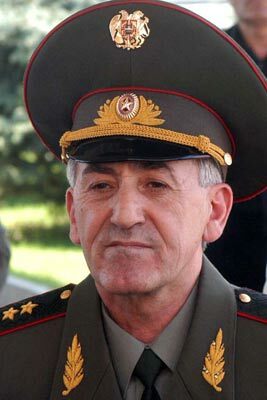 Harutiunian, who previously served as defense minister and chief of the Armenian army’s General Staff, denounced the violent scene as “unacceptable.” “Such officers have no place in the army,” he said, expressing confidence that the army will be “cleansed” of them in the near future. Artur Sakunts, a human rights campaigner monitoring violent incidents within the army, said he is worried that the Defense Ministry may seek to punish them as well. “Instead of encouraging the spread of information about army crime, the Defense Ministry is trying to muzzle people,” Sakunts told RFE/RL. Sakunts also demanded that the investigators bring more serious accusations against the arrested officer. Armen Harutiunian did not rule out such possibility.